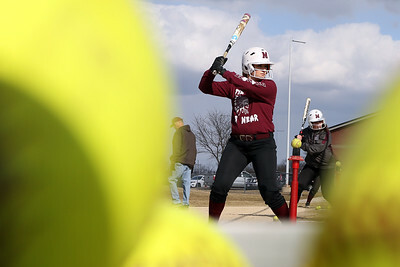 Matthew Apgar - mapgar@shawmedia.com Susie Nawrot focuses on the ball before laying down a bunt during softball practice at Marengo High School on Monday, March 12, 2018 in Marengo. 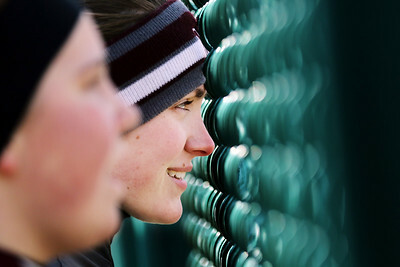 Matthew Apgar - mapgar@shawmedia.com Olivia Pribyl (left) and Riley Connell watch teammates take at-bats during softball practice at Marengo High School on Monday, March 12, 2018 in Marengo. 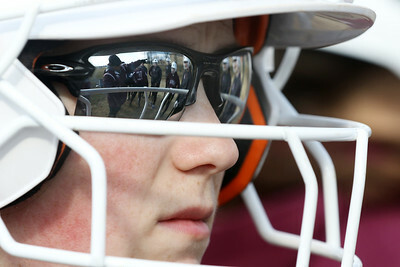 Matthew Apgar - mapgar@shawmedia.com The Marengo Indians are reflected in sunglasses worn by Grace Houghton during softball practice at Marengo High School on Monday, March 12, 2018 in Marengo. 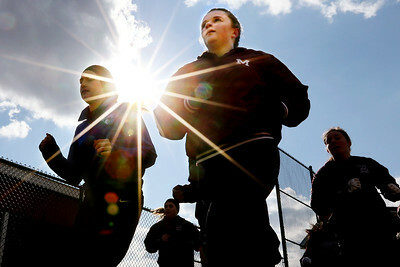 Matthew Apgar - mapgar@shawmedia.com Marengo softball players Lauren Aubry (left) and Anna Waisweer (center) run laps around the diamond with teammates during softball practice at Marengo High School on Monday, March 12, 2018 in Marengo. 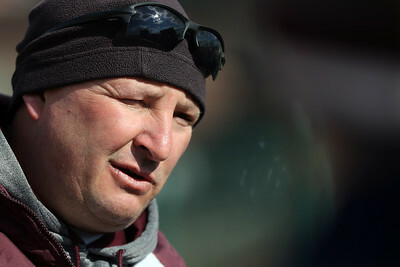 Matthew Apgar - mapgar@shawmedia.com Coach Dwain Nance talks with the Indians during softball practice at Marengo High School on Monday, March 12, 2018 in Marengo. 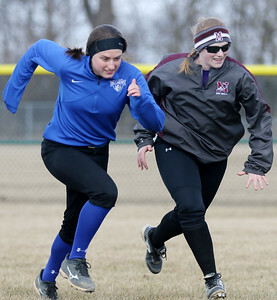 Matthew Apgar - mapgar@shawmedia.com Marengo's Lauren Aubry (left) and Grace Houghton sprint during warmups for softball practice at Marengo High School on Monday, March 12, 2018 in Marengo. 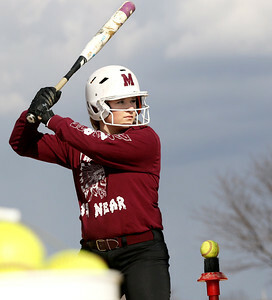 Matthew Apgar - mapgar@shawmedia.com Anna Waisweer takes swings on a tee during softball practice at Marengo High School on Monday, March 12, 2018 in Marengo. 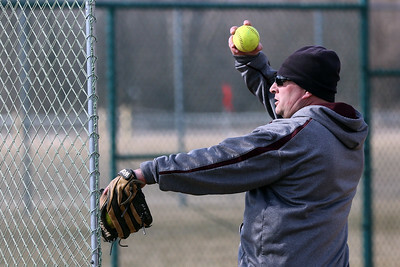 Matthew Apgar - mapgar@shawmedia.com Coach Dwain Nance throws pitches to batters during softball practice at Marengo High School on Monday, March 12, 2018 in Marengo. 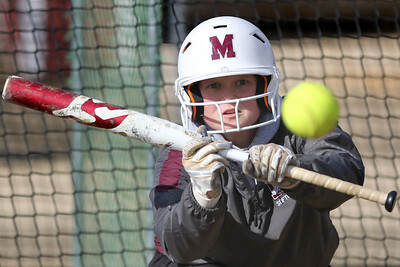 Matthew Apgar - mapgar@shawmedia.com Anna Waisweer focuses on the ball to before laying down a bunt during softball practice at Marengo High School on Monday, March 12, 2018 in Marengo. 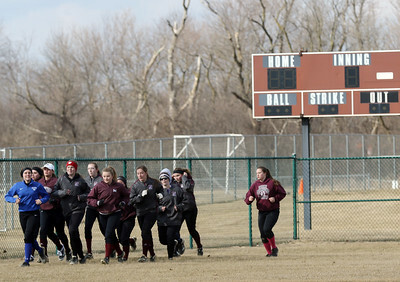 Matthew Apgar - mapgar@shawmedia.com Marengo Indians run laps around the diamond during softball practice at Marengo High School on Monday, March 12, 2018 in Marengo. 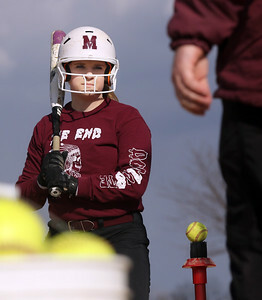 Matthew Apgar - mapgar@shawmedia.com Anna Waisweer talks with coach Dwain Nance (right) while working on batting technique during softball practice at Marengo High School on Monday, March 12, 2018 in Marengo. 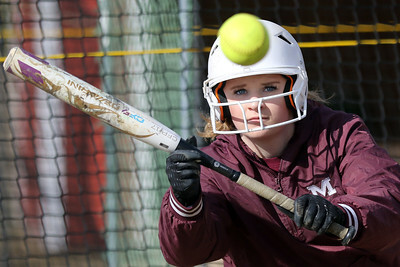 Anna Waisweer focuses on the ball to before laying down a bunt during softball practice at Marengo High School on Monday, March 12, 2018 in Marengo.